Hexmesh provides long term protection for armor applications in industrial floors. Specifically: Loading docks, ramps, high trafiic aisles for forklifts and trucks, hot floors for foundry, forge and steel mills, refuse disposal plant floors and almost anywhere floors are subject to severe impact and rolling loads will benefit with Hexmesh. • UNLOADING DOCKS, APPROACH RAMPS, LIFT TRUCK & TRUCK WAYS, FOUNDRY FLOORS / ALUMINIUM AND NON FERROUS, INDUSTRY FLOORS, FORGE & STEEL MILL FLOORS, INCINERATORS AND REFUSE STORAGE AREAS, ANY FLOORS SUBJECTED TO VIOLENT IMPACTS OR HIGH TRAFFIC AREAS. Once the hextile floor area is installed using compatible grout and mortar, the HEXMESH™ surface armor becomes the wearing surface. The concrete materials are locked and anchored within the individual HEXMESH cells. 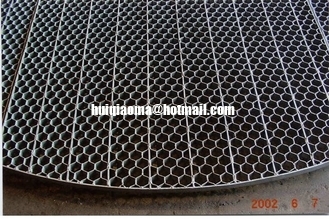 WHY USE HEXTILE WITH HEXMESH FLOOR ARMOR? All concrete cracks. It does so as a result of inherent internal stresses set up as it cures, in combination with the forces of thermal expansion and contraction. This natural cracking is only increased by external stresses such as rolling and impact loads. Spalling, and ultimately the failure, of a concrete slab begins with the first crack. As the crack grows it branches, weakening the slab, so that eventually more cracks begin. As the process advances, it snowballs, resulting in ever faster degradation of the slab. If there are corrosive liquids that normally come in contact with the slab, they penetrate the cracks and make matters worse. Expansion joints, either formed or sawed, are the most commonly used method of controlling concrete cracking. They can help, but they are not a permanent solution. In some cases cracks form elsewhere in spite of them, and in other cases spalls begin at the edge of the joint itself. HEXMESH creates cracks in concrete before they happen by chance. Hextiles offer maximum resistance to cracking. The HEXMESH forms an entire floor surface of interlocked, two-inch hexagonal concrete blocks, each of which is virtually impervious to cracking. Moreover, the mesh mechanically locks the concrete within itself to prevent spalling indefinitely. The HEXMESH within the concrete also serves to distribute any concentrated load over a much wider area in "snowshoe" fashion, while it contributes to greatly enhanced wearing qualities of the surface. 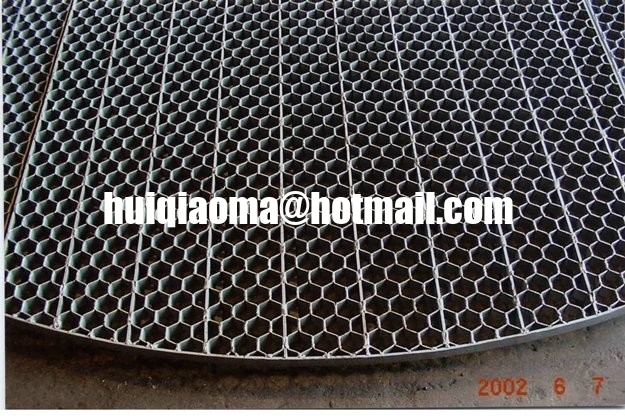 As the Hextile with HEXMESH armored concrete surface wears, the edge of the mesh begins to peen over, increasing the area of surface steel, more tightly locking-in the concrete, all the while maintaining the over-all flatness of the surface. The net result is the most durable concrete surface known today, especially for any area subject to severe and frequent rolling and impact loads.